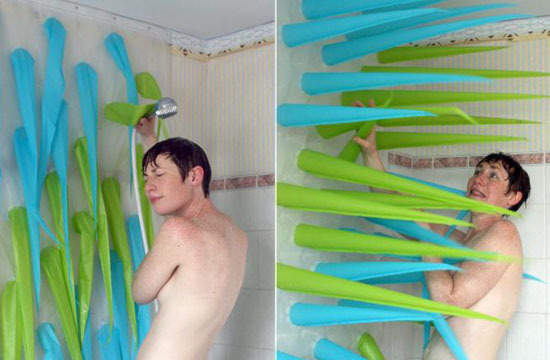 Spiky is unique inflatable shower curtain as part of series “My Shower Curtain is a Green Warrior”. Designed by Elisabeth Buecher, Spiky wants to remind you that you’ve been spending 4 minutes under the water, time to get out the shower. People usually are not aware how much water wasted during shower, this curtain inflates spikes to push you out, it’s a smart and harmless way to remind you that you have used too much water. You can’t stand in the shower anymore since these spikes take out all the space. Unfortunately Spiky is just art installation, it’s not real product, it aims to start a debate around water issues and spread awareness about your water consumption during shower.